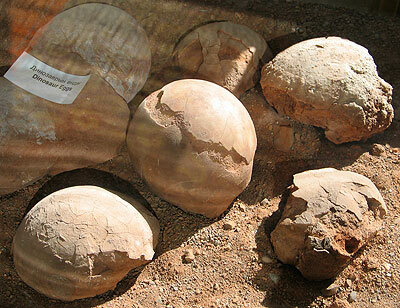 Did all dinosaurs lay eggs? How do we know? Were all dinosaurs reptiles, anyway? This week we feature an enquiry about dinosaurs from Peta S of New South Wales, Australia. Carl Wieland and Andrew Lamb respond. 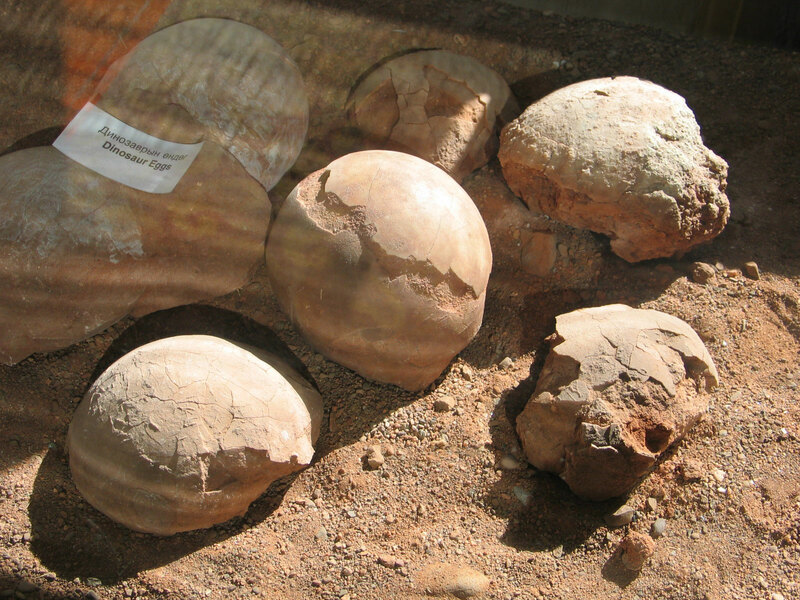 Fossilized dinosaur eggs in the Museum of National History in Ulaanbaatar. I guess it’s fair to say that there are many things about extinct animals we don’t know, but can make a very reasoned estimate about. For example, we wouldn’t know from bones alone that the extinct mammoth didn’t have totally different internal organs from other elephant-like creatures, but it is so highly unlikely, given the bony similarities, that we are not surprised when finding well-preserved frozen specimens that the prediction is borne out that the internal organs are like other elephants, indeed like other mammals. In the same way, we don’t know that some dinosaurs did not suckle their young, for instance, but it is highly unlikely, since there are certain patterns in nature that are quite systematic (the evolutionist explains them by common ancestry, the creationist by common design from a God of order who is neither arbitrary nor capricious in his use of structures in living things). So again, we’re not surprised by the fact that repeatedly, one finds a fossilized egg, sometimes with the baby dino inside, corresponding to a particular type of adult dino. And when some of the internal organs of dinosaurs are found, they correspond to non-mammalian patterns. Remember, too, that ‘dinosaurs’ is a man-made classification, and is based on certain bony characteristics that they all had in common. So given that the vast majority are known from fossils to have laid eggs, the chances that somehow there would be a radical departure from this in those where we don’t know this for sure is highly unlikely. Notice that ichthyosaurs, one of the marine creatures associated with the ‘age of dinosaurs’, although they would be properly classified as reptiles (they are not dinosaurs, nor are plesiosaurs, pterosaurs and so on), did in fact give birth to live young (we know this from the fossil record). But they nevertheless did this in a way similar to some living sharks–they laid the eggs inside themselves, and hatched them inside. So they were not viviparous, as mammals, or oviparous, as birds, but rather ovoviviparous. Fossil of an Ichthyosaur giving birth. Even the classification of creatures as reptiles has an ‘arbitrary’ element to it, based more on the exclusion of characteristics than on something they have (see paper at the end). For example, although reptiles have scales, so do birds. So scales cannot be used to say something is a reptile. What feature does a reptile have that no other creature has? We can’t think of any offhand. Some have suggested that maybe dinosaurs should really not be referred to as reptiles, but rather seen as a group all their own. But to suggest that some were ‘mammals’ would mean that, by definition, they were not dinosaurs. This is because mammals are defined as a class all of their own, and have characteristic features in the fossils, not just soft anatomy. If you mean did some of them have similar features to mammals, that was answered earlier as highly unlikely, for the reasons given. One can never say ‘impossible’ of course, but it is just so very, very unlikely as to hardly warrant consideration. Could some of the dragons described in the Bible have been mammals? Yes. But could some of the dinosaurs have been mammals? By definition, no. Now it is true that we believe that dinosaurs in the Bible would have likely been described using that word, but that does not mean that tannîn=dinosaur, period. Rather, the word tannîn would refer to a monster of some sort, which would include some (but not all) of the dinosaurs. I.e. a monster/dragon can be a dinosaur, but not exclusively—not all monsters/dragons were dinosaurs. And presumably, not all dinosaurs were monster/dragons in the Hebrew vernacular. The word tannîn does not imply some sort of reptilian characteristic, either. To demonstrate this, look at the description of Day 5 in Genesis, where the King James translates the word tannîn as ‘great whales’. Whales are mammals. But they are not dinosaurs. Hence, tannîn or ‘dragons’, can be certain dinosaurs, or certain mammals, but none of the dinosaurs can be mammals, by definition. Thus, if your question had been stated as ‘Could some of the dragons described in the Bible have been mammals?’ the answer would be, ‘Yes’. But to the question, were some dinosaurs mammals? The answer would be, ‘No’. We hope this helps. Below please see also the full text of a paper we sometimes send out in response to general questions on dinosaur classification. 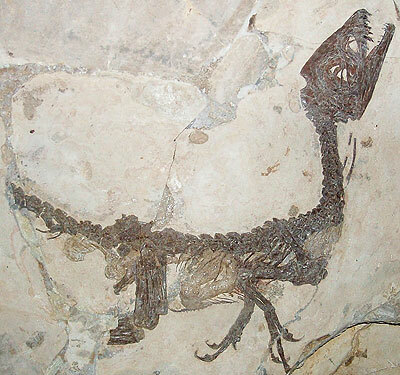 Fossil of a juvenile individual of Scipionyx samniticus at the National History Museum in Milan, Italy. The fossil preserves in an exceptional way clear traces of soft tissues, a rather rare event. There is considerable debate as to whether dinosaurs were cold-blooded or warm-blooded, and some of the ardent proponents of warm-bloodedness in dinosaurs may harbour notions of classifying them as something other than reptiles. If dinosaurs were not to be classed as reptiles, they would need to be put in their own unique class. The reptile class is a class by exclusion. It has been said that reptiles are the only class of animal without any unique distinguishing feature, i.e. that there is nothing reptiles have that no other class has. For example, reptiles have scales, but birds also can have scales, for example on chicken legs. Reptiles have amniotic eggs, but so too do mammals. Unlike with other classes, there is no feature that automatically identifies a creature as being a reptile. The issue of cold- versus warm-bloodedness in dinosaurs is still much debated among scientists. See Wikipedia’s entry on Physiology of dinosaurs: Metabolism. Most think that dinosaurs were reptiles, and some think that they may have continued growing even after they had reached sexual maturity, but this is an assumption. We don’t know for certain what the growth cycles of the various dinosaur kinds were, but study of rings in some dino bones has revealed a growth pattern similar to that of birds and mammals. See How did dinosaurs grow so big? The topic of dinosaur growth is also touched upon in our article Thunder lizards It is also an assumption to conclude that the very large dinosaurs were ‘waning’ and no longer sexually capable. Many books and museum displays make assumptions like these in the information they present about dinosaurs. There are many species of small dinosaurs of which large specimens have never been found, for example Compsognathus, which apparently never grew beyond the size of a hen. The average size of dinosaurs was about the size of a sheep. A strict Biblical approach to the classification of living organisms can be found in the book Biblical Classification of Life: A Framework and Reference for Authentic Biblical Biology. See CMI’s review of this book: A rose by any other name. Some years ago, some scientists attempted to construct a classification system based on the protein composition of organisms, but due to the lack of discernible patterns, this attempt lapsed. Now, the implications of DNA studies with respect to classification are being considered, but despite continuing zealous investigation, patterns in DNA that fit with evolutionary expectations are proving elusive. See Is the evolutionary tree turning into a creationist orchard? Classification systems used to categorise living things into groups for easy reference are merely something constructed by humans. As human constructs such systems are subject to change and to scientific consensus. The prevailing Linnaean classification system has undergone major modifications in the past and will no doubt undergo changes in the future. Scientists use strict morphological criteria for classifying animals into the various orders. Technically the word ‘dinosaur’ refers only to animals in the orders Saurischia and Ornithischia. Specific characteristics of the foot, limb, and hip bones are used to distinguish members of these two orders from other reptile orders. Probably the major visually distinguishing feature of dinosaurs is that they walk with ‘upright’ legs, rather than the ‘sideways’ legs of typical reptiles. Differences in ear, jaw, hip, and limb bones are used to differentiate between reptiles and mammals. All known living reptiles are cold-blooded and have three-chambered hearts. There has been at least one four-chambered heart claim—see Fascinating four-chambered fossil find! However that evidence is equivocal. If some dinosaurs were found to be warm-blooded, they would probably still be categorised as reptiles due to the bone differences mentioned previously. This brings to mind the situation with fish. The vast majority of fish are cold-blooded, but some are warm-blooded. In general English the word ‘dinosaur’ is used rather loosely to refer to a much wider range of creatures than that specified by its taxonomic meaning. Plesiosaurs (marine reptiles) and pterosaurs (flying reptiles) are commonly referred to as dinosaurs, but never mammals such as the rhinoceros. Many extinct rhino-like creatures have been classified into their own mammalian order, Embrithopoda. There are about 700 names of dinosaurs, but many of these are thought to be just different names for the same animals. There are perhaps only 55 different ‘kinds’ of dinosaurs. See Were dinosaurs on Noah’s Ark? More information is available under the topic ‘Dinosaurs’ in our ‘Frequently Asked Questions’ index.